Learn a new twist on a classic sauce! 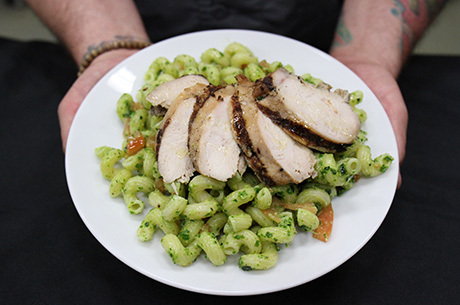 In this month’s Farm to Fork series, we are featuring a unique twist on traditional pesto. Pesto is a sauce made with garlic, pine nuts, basil leaves, parmesan cheese and olive oil. It’s commonly used on pasta or in sandwiches. 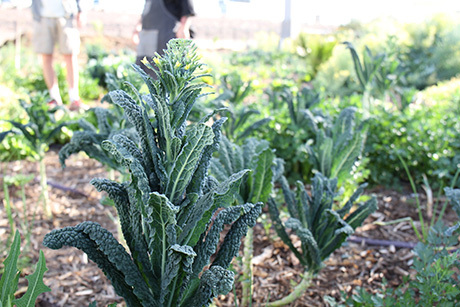 Using fresh kale from our Urban Farm, head chef Chris Hoffman tweaked the traditional recipe, creating a delicious new sauce! This recipe calls for two powerful foods: walnuts and kale. Maria Silva, SVdP’s Family Wellness Program registered dietitian, shares that walnuts are a nutrient-dense food packed with antioxidants, vitamin E, and vitamin B6. They are a great addition to meals as they help prevent age-related decline in brain function and prevent cardiovascular disease. Commonly known as a “superfood,” kale is packed with antioxidants, and vitamins A, K and C. Including kale in your diet can help protect your vision and reduce the risk of heart disease! 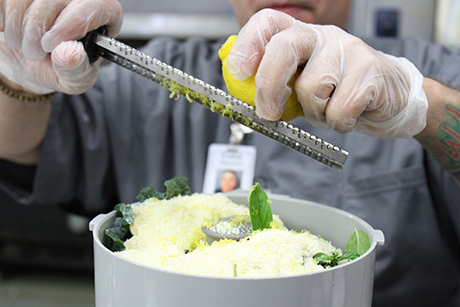 Put the walnuts, basil, kale, Parmesan cheese, salt, and lemon zest and juice in a food processor. While blending, slowly pour in the olive oil. Once all ingredients are blended to a slightly creamy consistency, taste the pesto and add additional seasonings to taste. Add to freshly made paste or use as a sandwich spread and enjoy! Coloca las nueces, albahaca, col rizada, queso, sal, el zumo y jugo de los limones en una licuadora. Licua a una velocidad mediana y poco a poco agrega el aceite de oliva. Prueba y sazona al gusto. Esta receta contiene dos alimentos poderosos: la nuez de castilla y la col rizada. La nuez de castilla contiene altos niveles de antioxidantes, vitamina E, y vitamina B6. Es un gran alimento que nos ayuda a prevenir la decaída del funcionamiento cerebral causado por la edad y previene las enfermedades cardiovasculares. La col rizada por otra parte nos provee con alto contenido de antioxidantes, vitaminas A, K, y C. Incluir la col rizada en nuestra alimentación nos ayuda a proteger la vista y reducir enfermedades del corazón. 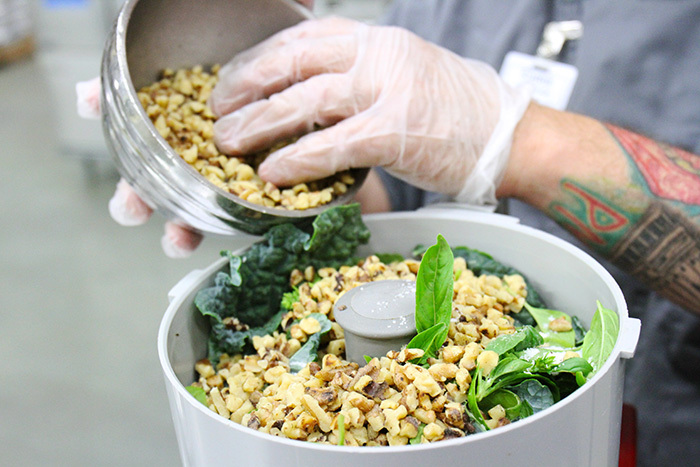 We’d love to see the dishes you prepare from our Farm to Fork series! Tag us on Facebook, Twitter or Instagram with your posts using #SVdPFarmtoFork.